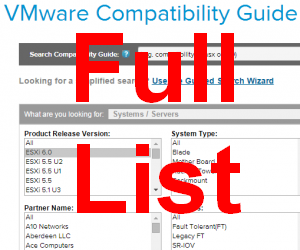 Double check your vendor support when updating ESXi hosts from VMware vSphere 5.5 to 6.0. There are a lot of systems that are no longer supported. The following servers were supported in 5.5 U2 but are according to the VMware HCL no longer supported in vSphere 6.0. Your server is listed and you want to upgrade? Don't panic. Not supported does not mean that it does not work. Servers get certified by their vendor, not VMware. If you want a server to get certified, ask your vendor. This post contains a sortable and searchable list containing all vendors. It extends the shortlist of widley used servers I maintain since the vSphere 6.0 release. Cisco C460 M1 and M2 are supported for ESXi 6.0U1 with the latest UCS release for that platform (1.5.7).